Wired is the magazine that should be selling more than anyone else on the iPad. And it has executed… fairly well, up to a point. So how is it selling? Well, according to Conde Nast, after the initial surge of curiosity pushed sales over 100k, monthly sales have settled at around 32,000. At $3.99 an issue and allowing for Apple’s 30% commission, that works out at just under $1.1m a year, plus advertising. So, they’re probably covering their production costs, but not a huge amount more. Doesn’t sound too inspiring, does it? But what broader conclusion should we draw from this? That magazines don’t work on the iPad? Not at all. Take a look at this chart (all the numbers are from Conde Nast and pretty easy to find). 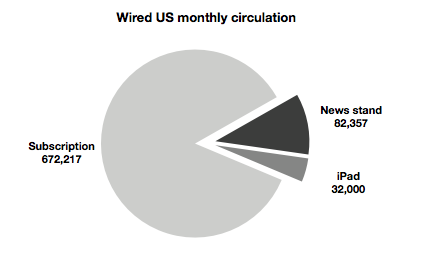 85% of Wired readers subscribe. Subscribers can’t use their subscription to get access to the iPad edition - they’d have to pay twice. And since there’s little or nothing extra in the iPad edition that you can’t get in the print title and the website, they don’t. In other words, almost everyone who cares about Wired already subscribes, and most of those people won’t buy the iPad app. And so, the fact that Wired is only selling 32k copies on the iPad right now tells us precisely nothing about demand for magazines on the iPad. Indeed, the fact that iPad sales are 40% of newsstand sales suggests pretty high adoption amongst impulse purchasers. Coming soon: an agreement between publishers and Apple that may address this. But tangentially, I suspect that today, Conde Nast may not even have a system that could give print subscribers a free login to an iPad app, even if Apple let them.